At the height of its late 2005 rally, natural gas in the U.S. was selling for just over $16/MMBtu, 350% higher than today’s price of $3.56. The oil/gas ratio, now over 18, is an all-time high… suggesting that natural gas is dirt cheap. So, it’s a buy, right? In a phrase, not exactly. According to the report, the increase in gas discoveries and production improvements means that North America shouldn’t have to be concerned about gas supplies for up to 100 years! Dr. Marc Bustin provided an overview of the situation in the May edition of Casey Energy Opportunities. 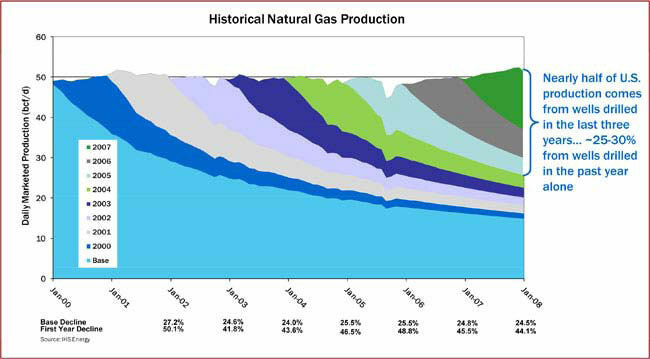 In the United States, the tremendous growth in natural gas resources and estimated recoverable natural gas, particularly from gas shales, just in the last two years (Figure 1) is sending tremors through the entire industry. These tremors include the risk of making obsolete the proposed $26 billion Alaskan and $16 billion northern Canadian pipelines to tap northern gas resources and a slue of proposed LNG terminals... unless they are for export! 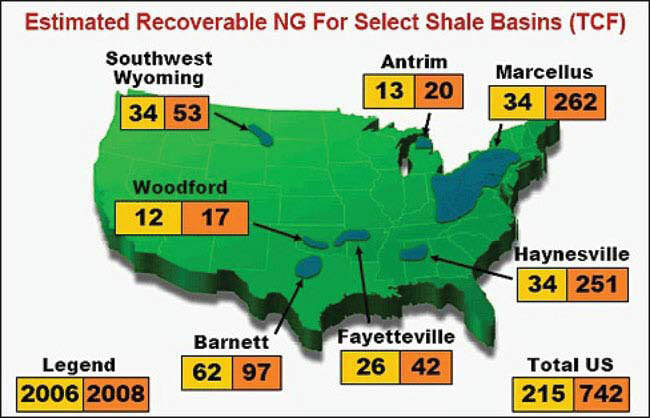 The numbers currently kicked around are that something around 2,000 trillion cubic feet of gas are technically recoverable in the United States. At current production rates, this supply would last about 90 years. Some analysts are predicting that even if the U.S. economy recovers in the next year, the amount of gas discovered to date in gas shales will severely dampen any increase in gas price for some time. According to a new study by energy consulting firm CERA (Cambridge Energy Research Associates), new technologies for unconventional gas fields are being applied so successfully that supply is essentially no longer a driver in either production or price in the North American gas market – whatever the market wants, North American gas fields can supply. CERA reports that natural gas production in the Lower 48 states has risen a startling 14% from 2007 to 2008, for example. and 2008. Modified from Daily Oil Bulletin (May 4, 2009). Given the increase in production and the small slide in demand, the price of natural gas has fallen to around $3.50-$4.00 per MMBtu (down from $13 per MMBtu last summer). At these prices, many gas prospects are uneconomic, and thus there has been a marked decline in the number of wells being drilled. Rig activity (how many rigs are operating) is down about 50% in North America. But here is where an interesting feedback mechanism kicks in. One of the characteristics of unconventional shale gas wells, and to a lesser extent natural gas wells in general, is that the production rate declines through time. Most shale wells’ production rates decline 60 to 90% in the first year. If you were a gas company trying to survive amidst today's low prices, the rate of return on your capital investment would also be painfully low for a significant amount of gas if this were your initial year of production. Another complementary fact is that over 50% of natural gas consumed in the United States today is from wells drilled less than three years ago, and 25-30% of the gas produced today comes from wells drilled last year (Figure 2). Hence it follows that if there are 50% fewer wells drilled this year (from the drop in rig activity), new production will decline about 35-40% by the end of the year, so there will be gas shortages. Those will in turn lead to higher North American prices, which in turn should lead to additional drilling. Everything else being equal (which it's not, this being the real, not the mathematical world), gas prices and drilling will see-saw until an equilibrium is reached. In detail, of course, things are more complicated, but it is pretty clear that gas prices will have to rise within the year, and the big losers will remain the more expensive plays that require higher gas prices to be economic. Where will the gas price end up in the short term? A poll of analysts by Reuters suggests $6 MMBtu in 2010 (Daily Oil Bulletin, May 4, 2009), but I don’t think I would bet on a gas price based on a vote by analysts. At the same time, it's an interesting coincidence (or not – coincidence, that is) that many prospects become economic at around the $6 MMBtu range. Among them are the Haynesville and Marcellus shales – and it's no large leap from there to see their tremendous gas production potential acting as a buffer to gas prices going much higher in the near term. Thus, while there may be some seasonal and relatively short-term trading opportunities in natural gas, the overhang of ready supply places a fairly firm cap on the price. Which begs the question, which big-trend energy opportunities should be getting our attention today? Marin Katusa, who heads the Casey Research energy team, answers the question by, correctly, cataloging the opportunities according to geography. 1. Geothermal -- the most interesting of the alternative energy sources, by a wide margin. 1. Unconventional gas has, by far, the most upside. 3. Small hydro (such as run of river). First and foremost, you want to avoid infrastructure plays (pipelines, refineries, etc). Then you want to look for areas with huge oil potential, which have been held off the market by concerns over political risk. I like what Lukas Lundin is doing in Ethiopia, Somalia, and Kenya, hunting for “elephants” with the idea of eventually selling the discoveries off to the Chinese. There are a couple of useful lessons to be derived by investors looking to tap into the virtually unlimited opportunities in energy. First, just because something is “cheap” doesn’t mean it can’t stay cheap, regardless of historical ratios -- if there has been a fundamental shift in the supply/demand equation. Which is very much the case with North American natural gas. Secondly, geological and transport considerations make much of the energy complex a “local” market. For example, while North America enjoys an abundance of natural gas, Europe is forced to rely on the heavy-handed Russians for the bulk of supplies. As you read this, there are companies looking to break the Russian grip by applying the same unconventional gas technologies that have so successfully built gas supplies in the U.S. -- technologies that are only just now being applied in Europe. Early investors could reap huge profits. In short, the real opportunities are not found by simply “investing in energy” but rather by taking the time to understand the structural differences within the energy complex and cherry picking the special situations that invariably exist in a sector this large. David Galland is the managing director of Casey Research, LLC., a private research firm providing independent analysis and investment recommendations to individual and institutional investors in North America and over 100 other countries around the globe. To learn more about the monthly Casey Energy Opportunities advisory, including a special three-month, fully guaranteed trial subscription, click here now.